(CNN) – Rep. Dennis Kucinich, the seven-term liberal Democrat from Ohio who has twice run for the White House, says President Obama committed an "impeachable offense" in deciding to authorize U.S. airstrikes over Libya Saturday without the consent of Congress. "President Obama moved forward without Congress approving. He didn't have Congressional authorization, he has gone against the Constitution, and that's got to be said," Kucinich told the web site Raw Story on Monday. "It's not even disputable, this isn't even a close question." "Such an action - that involves putting America's service men and women into harm's way, whether they're in the Air Force or the Navy - is a grave decision that cannot be made by the president alone," the Cleveland-area congressman added. But the U.S. military launched its first airstrikes on Libyan leader Moammar Gadhafi's air defenses over the weekend, Obama announced Saturday, saying he had authorized "limited military action in Libya" and that "that action has now begun." That development outraged Kucinich, who first raised the prospect of impeachment on a Saturday conference call with liberal democrats, according to Politico. Speaking to Raw Story, Kucinich said he does not necessarily think the president should be impeached, but is convinced he has committed an offense which would justify that most-serious punishment. "I'm raising the question as to whether or not it's an impeachable offense. It would appear on its face to be an impeachable offense," he said. "Now, it doesn't necessarily follow that simply because a president has committed an impeachable offense, that the process should start to impeach and remove him." In a statement on his website Friday, Kucinich made clear he thinks Obama has violated Article 1, Section 8 of the U.S. Constitution, which grants Congress the exclusive power to declare war. "Both houses of Congress must weigh in. This is not for the President alone, or for a few high ranking Members of Congress to decide," Kucinich said in the statement on his website. On Monday, Kucinich sent a fundraising email to supporters in which he criticized the Obama administration's decision to pursue military action in Libya. "We are bombing Libya right now. Congress did not approve this action, according to the Constitution," Kucinich said in the email. "Such an action lacks legality in the United States and the President should have to answer to that. I mean this isn't anything that is a small matter. It's a very grave matter, actually. Stand up. Contribute." Kucinich unsuccessfully sought to initiate Articles of Impeachment against President Bush in 2008 over the Iraq War. Then-House Speaker Nancy Pelosi halted the effort. Obama the constitutional law professor violate the Constitution you say?? Blasphemy! Force a citizen to buy a product from a company you say?? Double blasphemy!! Surely our know it all President knows exactly what the Constituion says but you have to understand it is a work in progress that is to be used when convenient and tossed out when inconvenient to his ends. Welcome to the rule of the king and not of the law people. Dennis , how much tax payer money did you get for biting on an olive pit ? I respect Mr. Kucinichs' opinion, but we have not declared war. I'm not sure why he's bringing ths up. The action that we took in Somalia in the 90's was not a declaration of war. We need term limit for elective offical case in point. I believe our founding fathers made it very clear this will not be Monarch but some people trying to make it one while criticial of others.Bless. Someone tell Kucinich to shut the hell up!!! 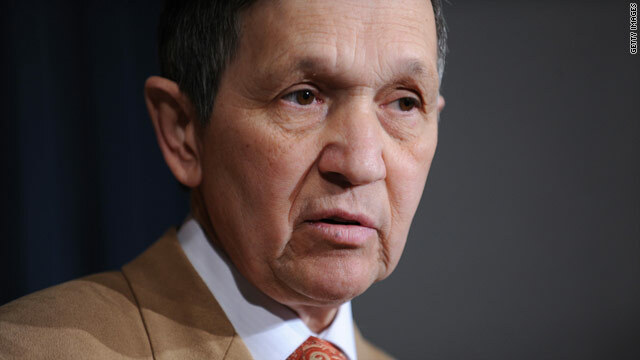 Kucinich calling to impeach a president? Doesn't he do this with every one of them? He's just feeling lonely and wants people to pay attention to him. Go away, Smegal! And we should listen to Kuchinich because? If Reagan asked permission from congress to bomb Libya in the 80's and Clinton when he bombed afghanistan in the 90's and W when he bombed afghanistan THE DAY OF 9/11, then you'd have a point. But they didn't, so you don't have a point. With respect to Mr. Kucinich, have you read the constitution? As a senator this is a sorry attempt to stir political turmoil. The president can engage in war for 90 days without congressional approval. This is something discussed in High School Political science. No Air Force One ride to Kucinich next time he flies back to his homeplace. I ditto Lynda: Perhaps Congress ought to start impeachment hearings against Kucinich for threatening to sue its cafeteria for $150,000 over the olive pit that chipped Kucinich's tooth. Correct me if I'm wrong, but I could swear that I learned back in school (granted that was 20 years ago, but still) that the President can commit his forces for a couple of weeks before having to consult congress. I like Kucinich and everything, but I really don't think that he's correct here. Even if it's"impeachable", and I don't think that it is, there are too many similar precedents made by Presidents that came before him. The president does not need congress's approval to launch air strikes. He needs it to go to war. We are not at war with Libya. Hence, Kucinich's argument is garbage. We don't have all the info. Neither does Kucinich. When that information surfaces, cast your stones if you want. For now, shut it. This is why the Democrats will not see one red-cent from me: idiots like Kucinich. I've said it before and it bears repeating again: Take a page from the RethugliKKKlan Book of Politics and stick together whether you're right or whether you're wrong. Hey Kucinich: A house divided and all that good stuff.....STFU already you blthering idiot, your ignorance is in full display. Our President was a professor of Constitutional Law. Good grief! War Powers act 1973. I am an Ohioan and respect Representative Kucinich greatly but he needs to check with his legal team and not the idiots on talk news before making an official statement, especially as inflammatory as speaking of impeachment. These posts only prove one thing.......democrats are idiots.